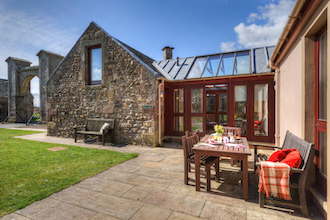 The West Lodge is a stylish holiday cottage in the Scottish Borders. Set at the West Gate of Wedderburn Castle, it dates from 1820 and combines historic charm with modern comfort and stylish decoration. 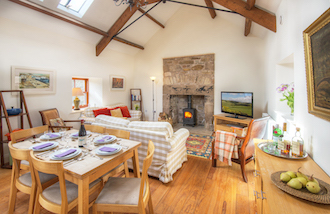 The property has been recently remodeled and now has a stunning double-height kitchen and sitting area, complete with original wooden beams and an oversized dressed stone fireplace with wood-burning stove. The kitchen offers a spacious cooking area and is prefect for family meals around the ash dining table. Comfortable sofas surround a large flat-screen television with digital channels and a DVD player. The adjacent glazed sunroom looks across the surrounding lawn and woodland. 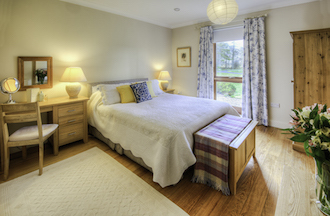 This space is perfect for reading and relaxing and leads to the newly-created bedroom wing of the West Lodge. In the bedroom wing there are two double bedrooms – both with king-sized beds and en-suite bathrooms – and one bedroom with twin beds. All bedrooms and the bathrooms are decorated in a contemporary style and appointed to the highest standard. 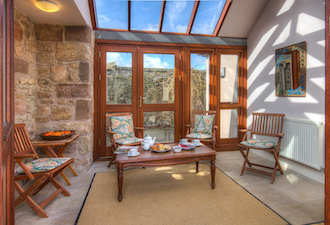 The West Lodge is set in formal parkland and woodland offering attractive walks and views of the Cheviot hills. There is parking for the lodge directly outside which is suitable for several cars. Ideal to get away from the husle and bustle."